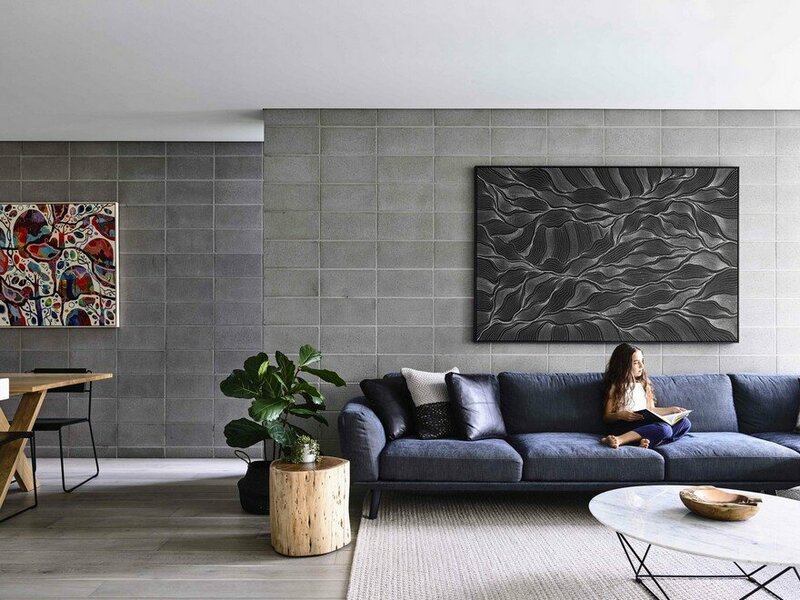 Description by architect: Masuto is a duplex project in the Melbourne, Australia. 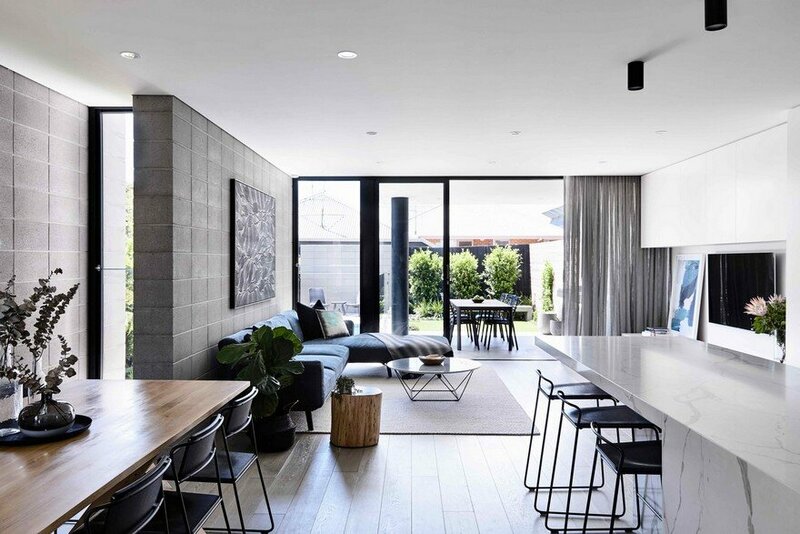 The elongated duplex residence is its own contemporary urban oasis; it enjoys an abundance of natural light, has a feeling of openness, is connected to the landscape, is spatially refined and efficient and beautifully textured and sophisticated. 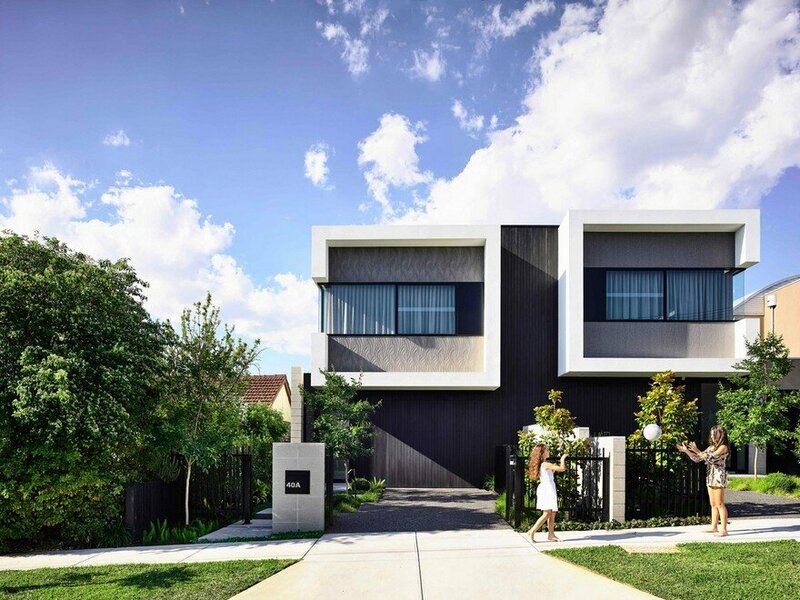 The project is an elegant addition to the streetscape with a presence that is not dominated by the commonly sighted double garage door arrangement. 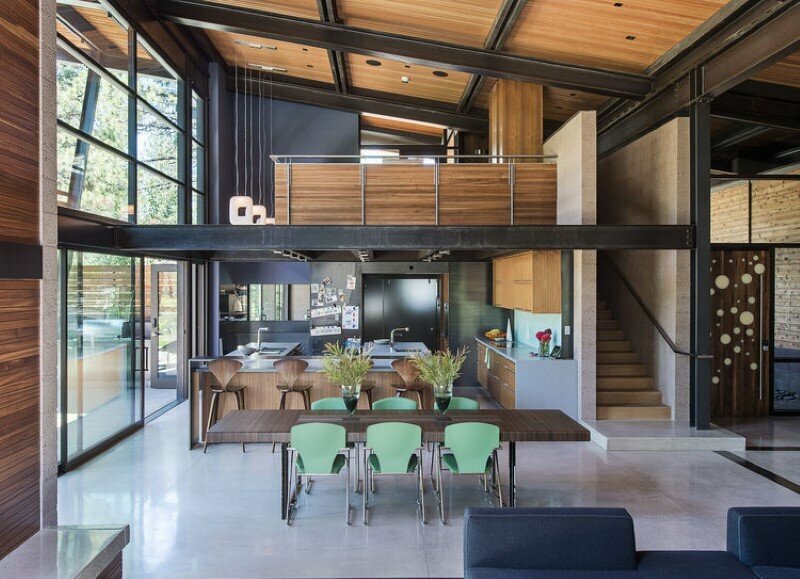 Inhabitable garages and utility rooms share the common wall and habitable rooms are on the outer perimeter, thereby permitting more natural light and natural cross-ventilation to the elongated plan. 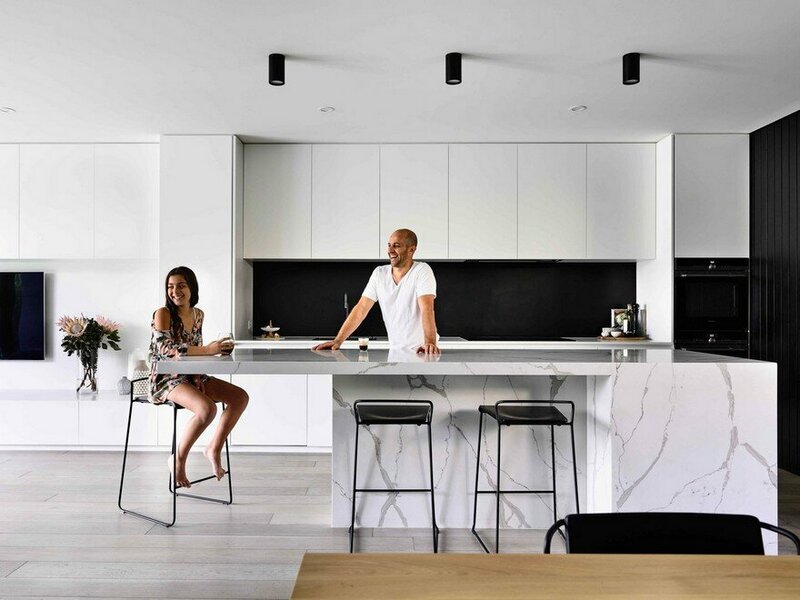 There is an arrival experience that invites and draws one from the street and entry on the south, through the residence, to the rear north-facing living spaces. 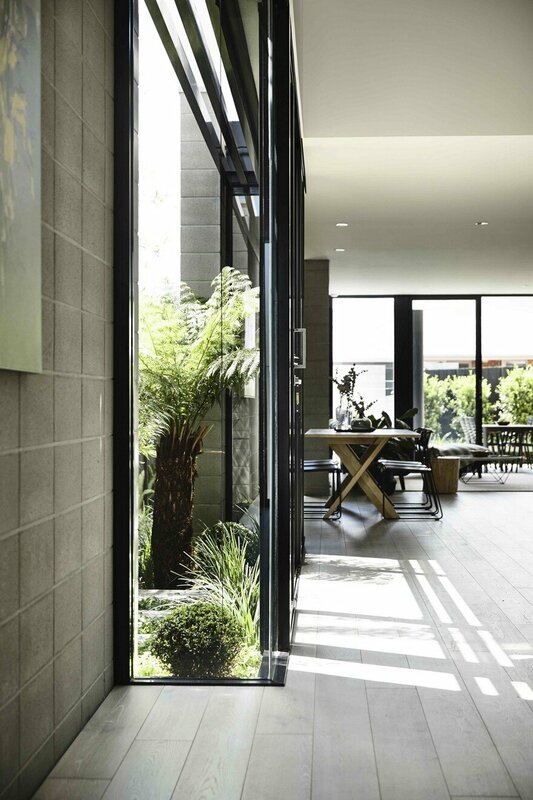 A central courtyard and off-set external blockwork blade walls allow natural light to flood the hallway and provide framed views and connection to the landscape whilst maintaining privacy between neighbours. 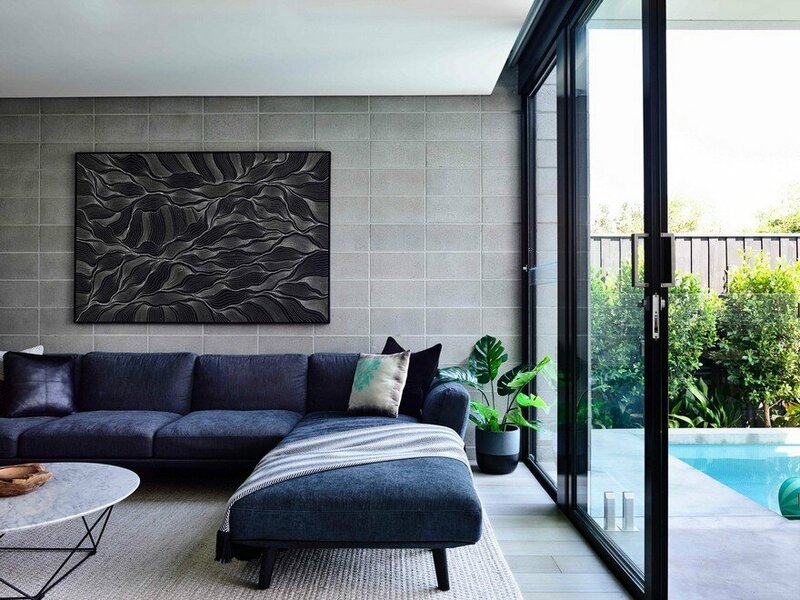 The opposite wall is the unassuming yet rich black stained vertical timber cladding which begins externally concealing the garage door then wraps the core of the duplex utility rooms. 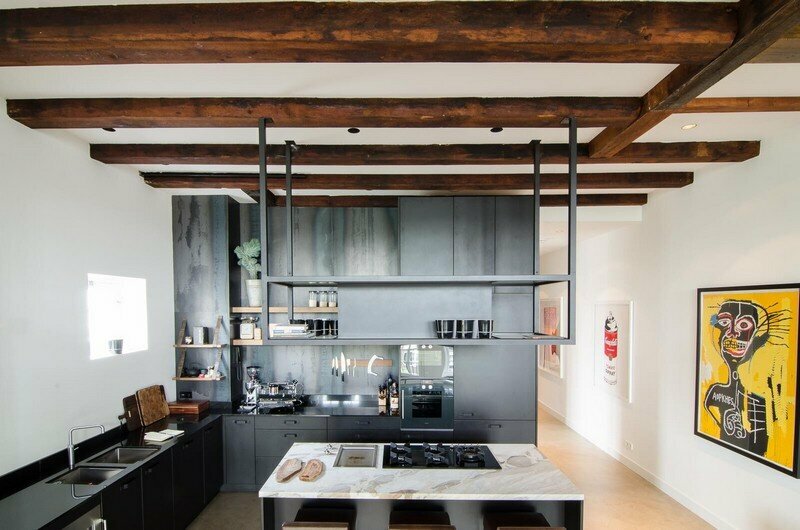 The rich darkness of the black timberform is punctuated by novel, refreshing white openings and recesses. Along the hallway is the external coloured grey blockwork and floor to ceiling glazing which provides natural light, natural ventilation and a sense of the landscape creeping in. 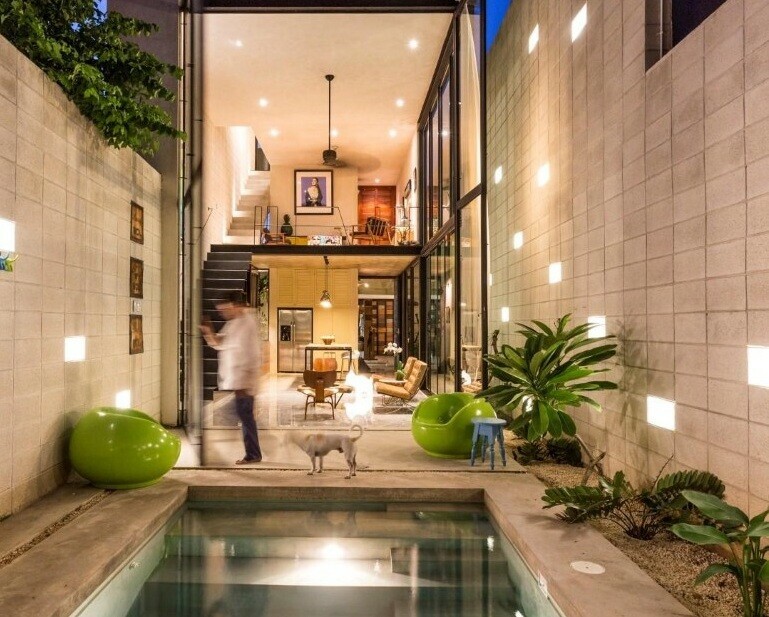 The side courtyard and two storey void at the staircase enhance the journey through the home. 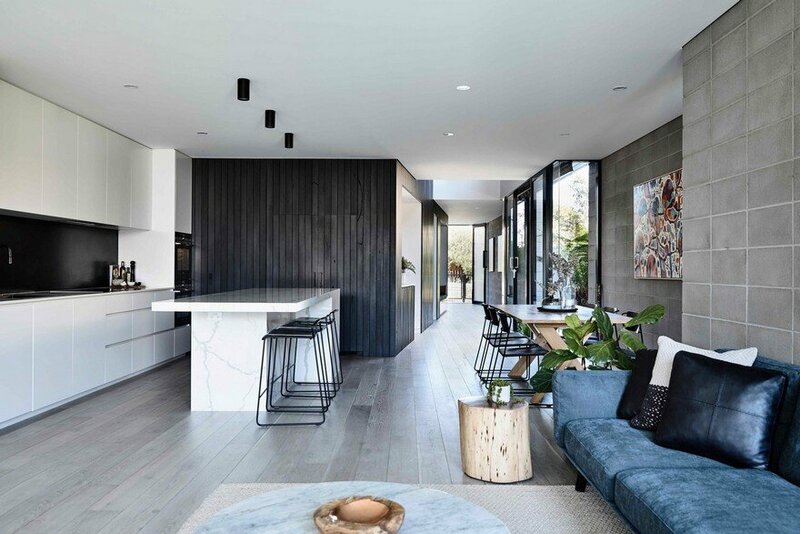 It also allows the space to open vertically, both visually and acoustically, to connect the upper and ground floor living areas to each other, the landscape and the sky. 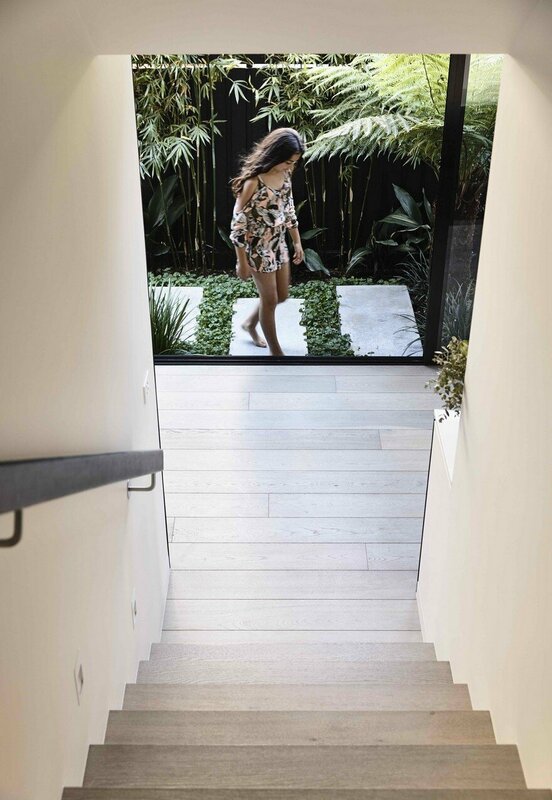 The hallway is also slightly splayed from the entry, to further open up the connection to the north-facing open plan living, kitchen, dining and rear backyard; a private oasis complete with covered alfresco, pool and tranquil garden. The upper level is the private domain of the duplex containing bedrooms and a family room. 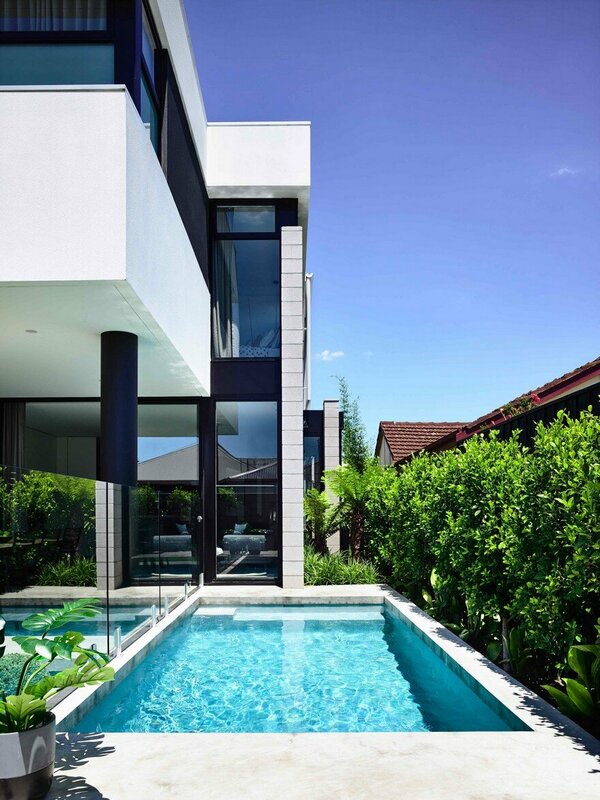 A rich and interesting palette of materials, finishes and textural qualities unifies the design both inside and out. 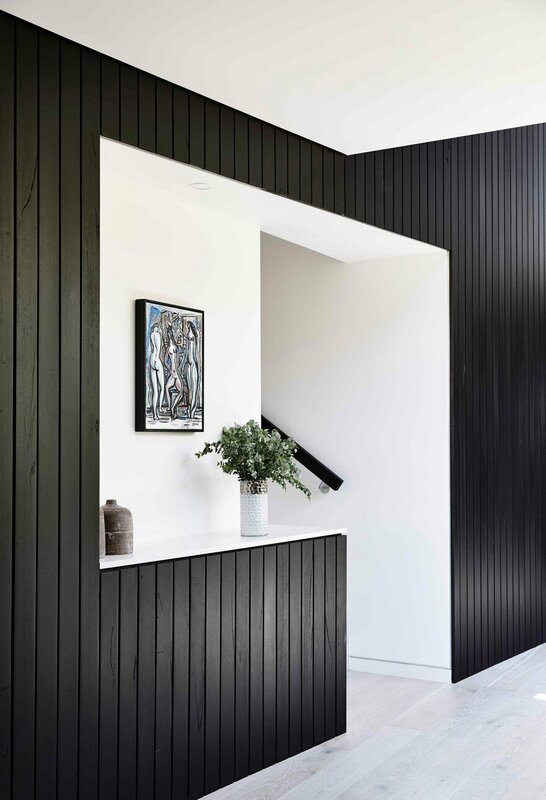 The rich black stained timber cladding softens the coloured stack bond masonry blockwork. 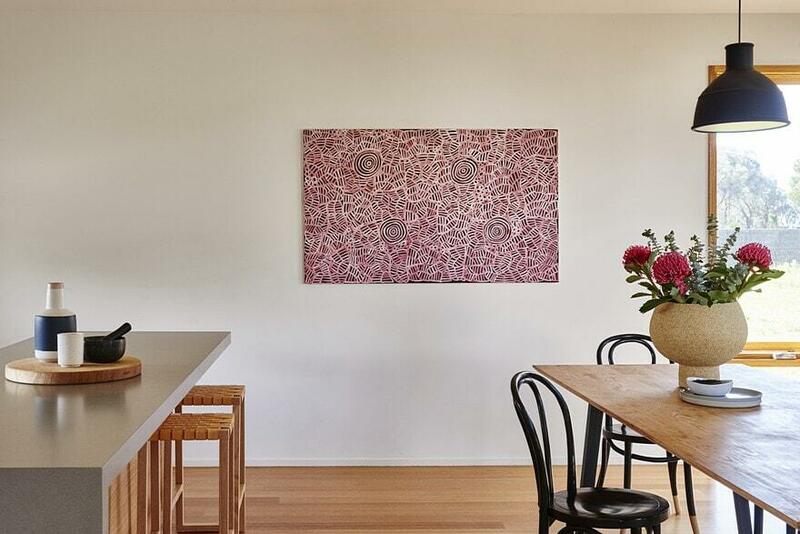 This material is expressed in its textural rawness and creates a gallery style wall and back drop for artwork and soft furnishings. 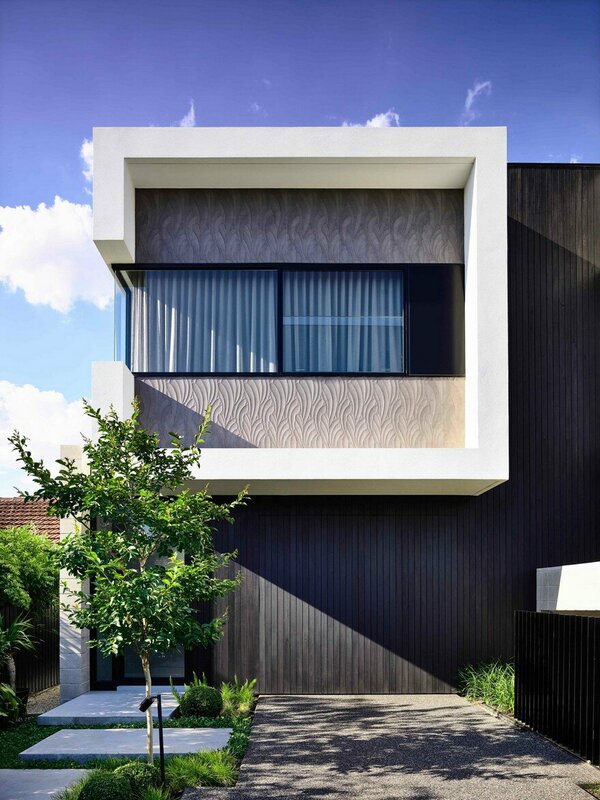 Three dimensional tiling to the southern facade is subtle and comes alive with shadows as the quality of light changes over the course of the day. A light grey French oak timber floor complements the grey blockwork wall and softens the contrast between the white and black throughout. 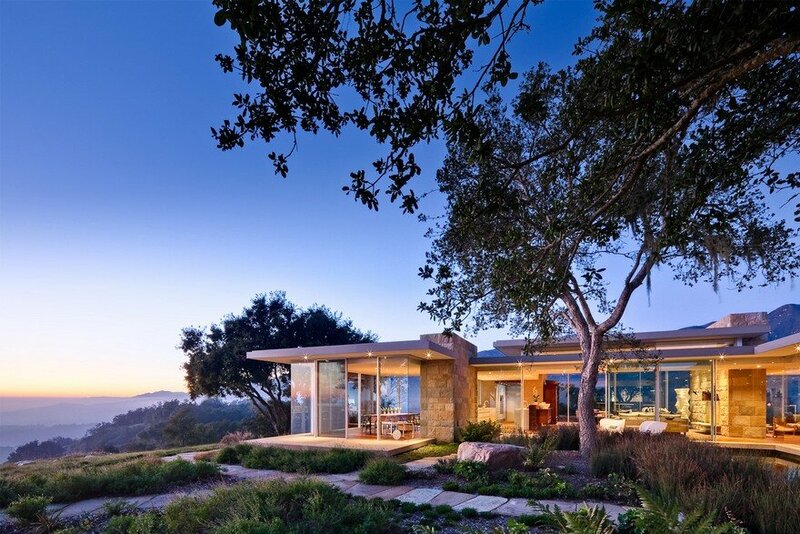 Passive solar design principles in conjunction with the thermal mass qualities of the reverse block veneer, and the proximity of landscaped vegetation has resulted in less energy consumption for lighting, heating and cooling, and improved natural cross-ventilation and air-quality. 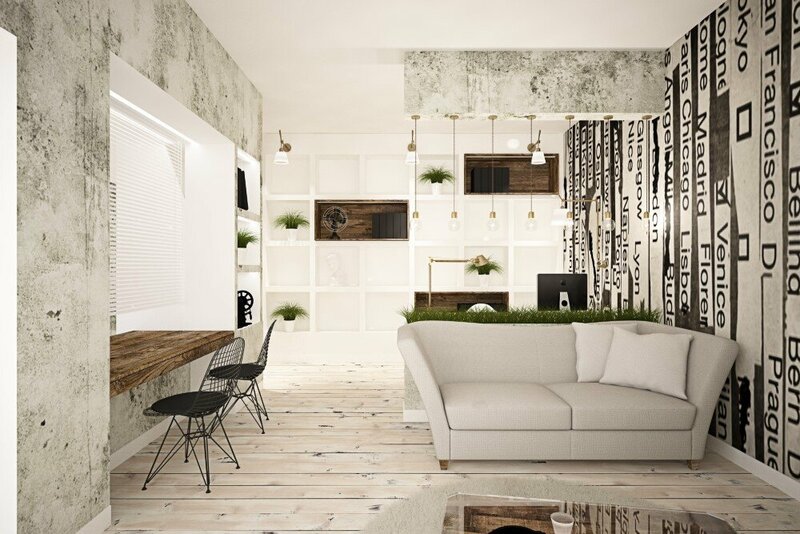 The overall result is a more comfortable, healthier and enjoyable living environment.